Oakland/ Bay Area record label and promo company RonDavoux Records/RDV promo recently released a 20+ minute Video and song featuring 39 artists from around the world on Jan 12, 2013 in memory and support of the Haitian community after a devastating 7.0 Earthquake killed over 300,000. people ( WATCH VIDEO NOW http://youtu.be/VvlYjns5c-g ) Many more were injured, displaced or lost family, possessions and general stability. As time has passed mainstream media seems to have forgotten about the massive disaster’s impact on a already struggling country. 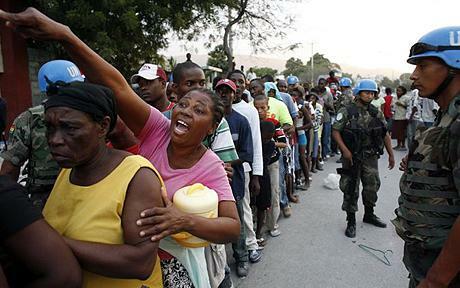 Most Haitian citizens still do not have basic needs like food or shelter. Extreme poverty and Corruption have made it hard to rebuild. DLabrie president and founder of RonDavoux Records, and Deputy Director of the National Hip Hop Congress decided to spearhead this project immediately after the earthquake in 2010. The song took 3 years to release which he says is a testament to HHC and RDV’s long-term commitment to the cause. Although the song that started out with one verse which appeared on his 2009 Mixtape “EOG Volume 3” ( Download Free Here http://goo.gl/Ld8c6 ) was intended to come out a lot sooner, DLabrie struggled to get the whole project complete with no real funding. He spoke to over 500 artists and put out public requests, and text blasts on social media to request verses or drops from anyone from famous to up and coming artists from ANY genre. The MC states that some artists were not available to record , others did not reply, while many showed immediate support. DLabrie who also goes by the alias MR NETW3RK which is the title of his new album (Listen or Purchase here http://goo.gl/UX8V9 ) utilized his and Hip Hop Congress’s huge international network to make this happen with little resources. He also stated that many engineers didn’t want the burden of putting together such a long song which could crash computers, become a tedious hassle & total up to a huge amount in studio fees. Part of the delay of releasing the song was the fact that the track changed hands with at least 3 or 4 different studios before finally being mastered and completed. While the song and graphic images in the video are one way to get the word out about Haiti. DLabrie also is working hard to form a lasting relationship with Haitian leaders and help bring programs and resources directly to Haiti through Hip Hop Congress. He has done several phone interviews to public radio in Haiti and spoken to Haitian ambassadors about ideas while learning the challenges. Although it remains to be seen how far this Hip Hop Congress for Haiti Movement can go and what is to come of it, this is a brilliant example of Hip Hop , Education, Activism & Unity within the positive impacts of Hip Hop. If you missed the chapter on Haiti in History class just listen to this for a full recap of Haiti’s history as the 1st independent Black nation not in Africa. RonDavoux remians true to it’s motto “Grind Relax and Give back” and Hip Hop Congress is without a doubt since 1997 still “Changing the World …1 Cypher at a time!! Hip Hop Congress for Haiti is a Hip Hop song created by Hip Hop Congress & RonDavoux Records to Raise Awareness and Inspire people to donate money and supplies to Haiti in support of rebuilding the country after the devastating earthquake in 2010. The song features Rap, R & B, Soul & Spoken Word from 39 Artists from around the world supporting Haiti in solidarity. HHC/RDV is releasing this song on the 3 year Anniversary to remind everyone that the struggle in Haiti is far from over. The song also discusses various topics about Haiti’s Historical Value from the perspective of each Artist & their diverse views!